Let the river carry you through a magical world, once out of bounds to ordinary mortals on holiday in Bali. Ride the white waters of Balinese River as it races to the sea from the slopes of Bali's highest mountain, through breathtaking, mist-shrouded gorges and waterfalls tumbling from the heavens. We offer the best well-known rivers for rafting Bali: Ayung river in Ubud, Telaga Waja River in East Bali and Bakas Rafting. Waterfalls, jungle scenery and a wet ' wild adventure experience into the heart of natural Bali awaits you. Get back to nature... paddle, splash and thrill to the rhythm of the paradise river. The Ayung River has been watering stability posses in the all weather as well as many rapids that the River categories from II up to III. Just four minutes from starting point to the river. 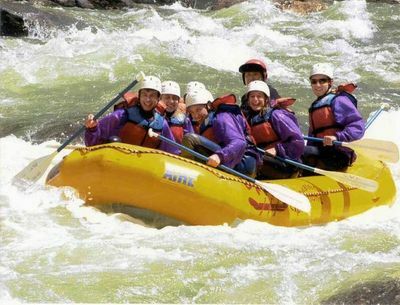 During your action - rafting trip your safety is our main priority. From the landing point just five minutes to the Restaurant. What to bring : change of clothes, swimming costume, sun cream, sport shoes. The adventure starts with an air-conditioned coach pick-up from your hotel or villa. A scenic ride through Bali's beautiful countryside takes you to the starting point in the village of Muncan in Karangasem, northeast Bali. Once there you will be divided into groups of no more than 4 persons and your guide will hand out the rafting equipment for the day - helmets, life jackets and paddle. Our journey takes you through tropical rain forest, breathtaking waterfalls and wild countryside on this exciting adventure. The Spirit of Adventure begins in the hills below sacred Mount Agung on the Telaga Waja river, perfect playground for this exhilarating sport. 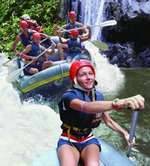 Bakas Rafting is located on the Melangit River between Eastern part of Gianyar and the Western part of Klungkung. From the heart of Denpasar City it is 45 minutes drive along good roads. The Melangit is a unique among riversin Bali. Its steep cliffs and rocks waterfalls, and sharp bends make it very attractive to the adventurous. With pollution free water and untouched tropical vegetation, it has a pure natural beauty that is especially refreshing. Because customer safety and satisfaction is our top priority, you can be assured of a truly memorable rafting experience. We invite you to join our professsionally trained guides on the enchanting Melangit River. Suitable for ages : 8 - 65. Our fully trained guides explain safety procedures and rafting techniques before launching. The journey involves maneuvering through waterfalls, bends, rapids and rocks, while viewing the beauty unspoild natural environment. After a welcome drink and briefing. a five minutes walk take you to the river to begin your adventure. Enjoy a sumptuous buffet dinner served in the restaurant which is a short drive from the finishing point. YOUR FARE INCLUDEDS : Air Conditioned Hotel Transfer. Complimentari Meal and Refreshment. Our Restaurant Shower & Toilet Facilities. WHAT TO BRING : Change of Clothes. Camera or Video Camera. Waterproof Bags are available.